Before leaving for our Portugal and Spain trip, Ryan and I did a little research on some food we wanted to try in Lisbon, and I wrote about it here. Now that we’re back, we miss the delicious food we were able to eat for every meal. We took full advantage of the proximity to the sea, and made sure to try everything I had researched beforehand. Looking back at the pictures makes me envious of my Lisbon-visiting self, but I can’t wait to share the local delicacies that have made us add Lisbon to the “places to revisit” list! First up is bacalhau, the nation dish of Portugal. We made sure to try this several times, since they are reportedly 365 different ways to make it (we only tried four). Bacalhau is my kind of fish – tender, salty, and full of flavor – and I loved it every single way we ordered it. The traditional way, served with potatoes, was fantastic. Both times we tried it this way it was covered in garlic and an oil and white wine vinegar mixture (that was not overpowering). The combination of bacalhau with potatoes is perfect – the soft potatoes and the firm (but tender!) bacalhau made the dish interesting and delicious. Also, both taste great cooked in oil and garlic. One of our only cheap meals (Lisbon is known for having cheap food, but there were tons of restaurants that had expensive food and, not being budget travelers, we followed the recommendations to some of the spendier joints) brought two more bacalhau dishes – Ryan’s with beans and mine with eggs. We had no idea what to expect. Mine was kind of like a bacalhau hash – cod, eggs, and potatoes all made in one pot and seasoned to (salty) perfection. And finally, on our last night, I had the opportunity to try the cod cakes, which were worth the wait. Mixed with dill and other less prevelant spices, the cod mixture was fried in a light batter and absolutely melt-in-your-mouth fantastic! I wish we could have tried a few more variations of the national dish, but I’m satisfied with our list. 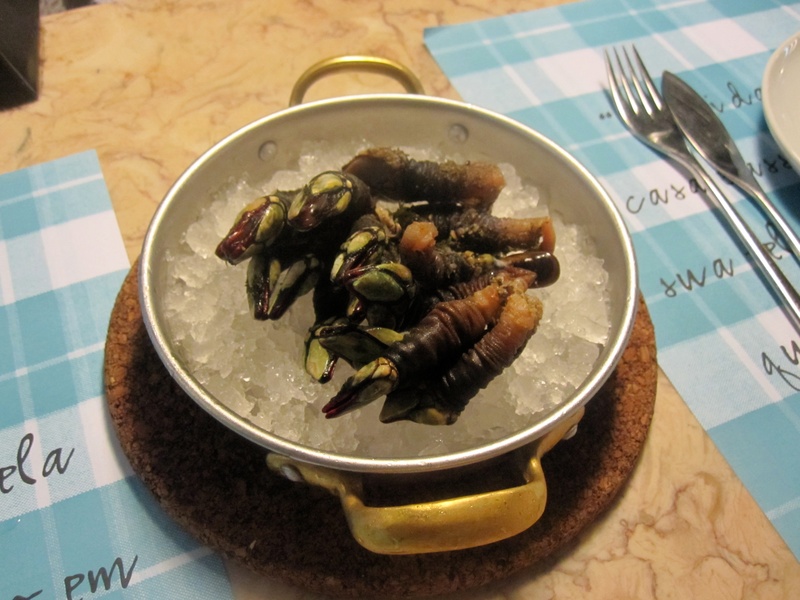 The percebes, or gooseneck barnacles, were something I desperately wanted to try, but we were not sure if we’d be going to a restaurant that served them. Luckily, our B&B recommened Sea Me (we highly recommend it if you love seafood and don’t mind spending a bit of money on delicious food) and to our pleasant surprise, they had percebes on the menu. I saw that and we immediately ordered 100 grams to start our meal. I had to ask the bartender (we sat at the bar) what a normal amount to order was. Not only am I confused by the whole “grams” thing (I know, how hard is that?) but I didn’t know what 100 grams meant in terms of percebes. Our percebes came out, and he had to show us how to eat them. We caught on right away and devoured our plate. The best way I can describe them: they taste like the sea. They are fresh, salty, chewy, and harbor a delicious salty liquid in their “skin.” We loved them so much that we ordered another round! And now onto the sweet: the famous Pasteis de Belem (or pasteis de nata, although we only tried the ones from Belem). These are definitely worth it. 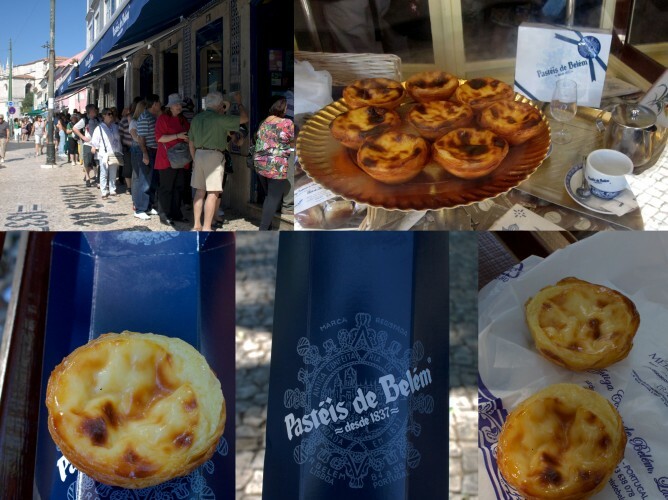 I can’t speak for the pasteis de nata sold elsewhere, since we didn’t try any, but the Pasteis de Belem were warm and sweet, and we could have eaten several more than just two each. A little bit about the shop – you can either stand in line (which looks long, but is super quick) to go to the to-go counter, or you can step inside and sit. We opted to get our to-go and then took them across the street to a shady park area with benches. However, we were told that there are multiple dining areas inside (I believe we were told seven) where you can better enjoy the pasteis. Next time! They are fairly small – probably a two to three bite treat, and cost 1.10 euros each. We decided to get four of them and, within a couple of minutes of ordering, we were handed a cardboard tube with four freshly made pasteis, and packets of cinnamon and powdered sugar to shake on top. And finally….the wine! 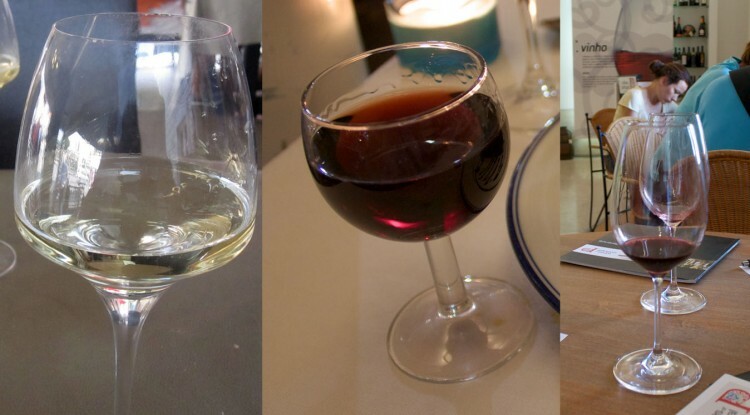 We made sure to have wine with every meal, and it was either vinho verde or a house white wine. The vinho verdes we tried were fantastic – light, fruity, and bubbly, and paired perfectly with our seafood. Sipping this wine helped to keep us cool on the hot days. To finish off each dinner, we tried a chocolate cake at each restaurant, and ordered a Port wine to go with it (always chosen by the waiters – we didn’t know which one to pick!). The strong, sweet wine was delicious. It’s not something I’d want a lot of, but a small glass each was perfect and brought out the best in the chocolate. The wine we were least impressed with was at the Wines of Portugal Center on the Praça do Comerçio. Overall it was an okay experience (I would even call it “good” if you have the time and won’t feel rushed because of it!) because we learned a bit about the different wine regions of Portugal. It would have been better to go here on one of the first days, so we could try the different wines with our meals. Anyway, the four wines we tasted were chosen for us, and none of them were too great. They weren’t horrible, but we just were not impressed. So, we stuck with vinho verde for dinner that night! If this post (or at least the pictutes) doesn’t make you hungry – you are crazy! 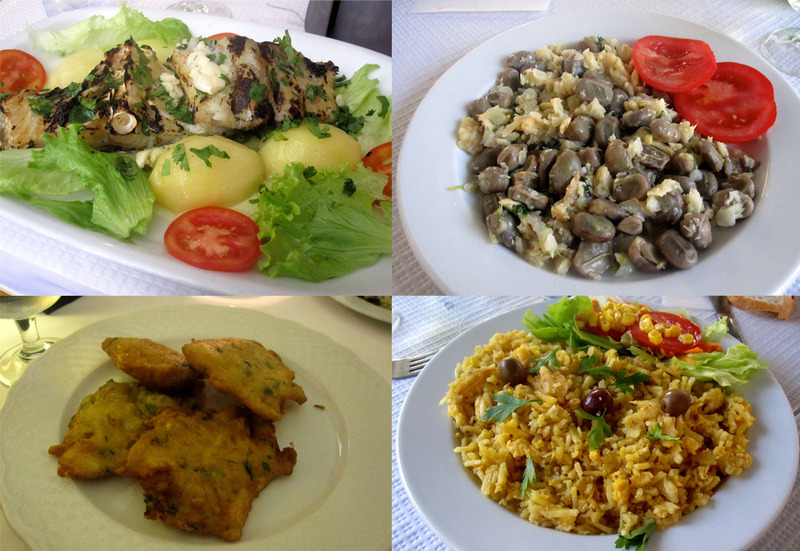 Looking at the pictures and thinking back to the food gets me so excited to return to Lisbon. Luckily, I managed to remember to buy a cookbook before we left, so hopefully I can try to recreate one or two Portuguese dishes at home. I’ve only just touched the surface with this post – I wanted to follow up on all of the food we were especially wanting to try. But, there are so many other food that are worth mentioning. Stay tuned! This entry was posted in Food, Travel and tagged Lisbon, Portugal, Portugal/Spain 2012 Trip by Kristin. Bookmark the permalink.